Often infused with messages and real life stories, Etana's music is credited with moving all who listen. Riveting songs like "Wrong Address," "Roots," "Not Afraid" and the latest single "August Town" stay true to Etana's signature style. But beyond the soulful singer's love of music, lies a passion to help the youth. And through out her impressive career, Etana has taken pride in inspiring and motivating youth through music and many other efforts. Morevoer, the soulful songstress is especially vested in empowering young girls. "I have always taken a special interest in the youth as they hold the key to the future," says Etana sincerely. "I am particularly driven to encourage young girls since they often don't recognize their full potential because of some of society's stereotypical roles placed before them." 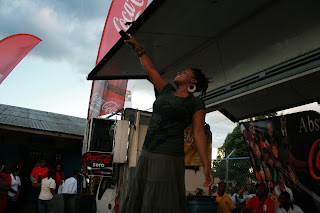 Etana incorporates the message of abstinence while performingbefore STATHS students on the RE High School Tour. "Overall, I want young girls to hold their heads up high and embrace their power......I typically tell them that they can do any and evertyhing once they put their mind to it," the singer adds. With seeds deeply rooted in the youth, Etana regulary talks to The Young Reggae Girlz, Jamaica's under 17 and under 20 female soccer teams. A hit among the team members, Etana shares music and life experiences with the team and encourages the girls to respect themselves so that others can respect them. Etana indicates that a major part of "respect" comes with abstinence. Further, the artist lets the Girlz know that it's okay to be strong black women. But no talk is complete with out focusing on the central theme of education. A critical component, the artist declares "education is the greatest way to overcome poverty and be successful." Motivational talks with the Reggae Girlz are just a snippet of Etana's commitment to the youth, as she regularly visits schools through out the world. No matter where Etana is performing, she goes out of her way to visit schools in the respective area. While the youth are too young to attend most of her performances, she brings entertainment directly to them by dropping in on surprise visits. Regularly, Etana sings some of her best known selections and intermittently motivates the classroom to pursue an education, stay focused and make good decisions. She continuously lets the classrooms know that all things are possible with education. Members of Jamaica's Young Reggae Girlz Soccer Team enjoy a visitfrom Etana. In addition to these independent efforts, Etana is now a featured artist on the RE School Tour. Recently, the powerful Etana commanded the standing room only crowd at the Tour's first stop at St. Andrew's Technical High School in Kingston, JA. There, "The Strong One" belted out a string of hits to the 700-plus crowd and was ever-so amused when students sang the lyrics verbatim. Although Etana was pegged for a 3-song set, the crowd's overwhelming response made her stay to perform 2 more songs. Through out her set, Etana consistently delivered the message of abstinence and staying in school to the youth and thanked the teachers for diligently molding and shaping the leaders of tomorrow. Etana is slated to perform on the tour each Tuesday that she is in Jamaica until the tour's end in mid-November. Etana willingly joined the RE School Tour for a second time because it's platform is directly in tune with her efforts involving youth. Etana's work involving youth is ongoing. It is the singer's utmost goal to launch a youth-driven foundation in the future centered on the themes of education and empowerment. Plans for this foundation, which will formalize Etana's efforts, will begin soon.